A compilation of reviews for Scythe: a game of farming and war, broken hearts and rusted gears. Scythe is so good as to almost defy description. One of the most hyped releases of 2016 (perhaps of all time) Scythe launched on Kickstarter to the tune of 1.8 million dollars. 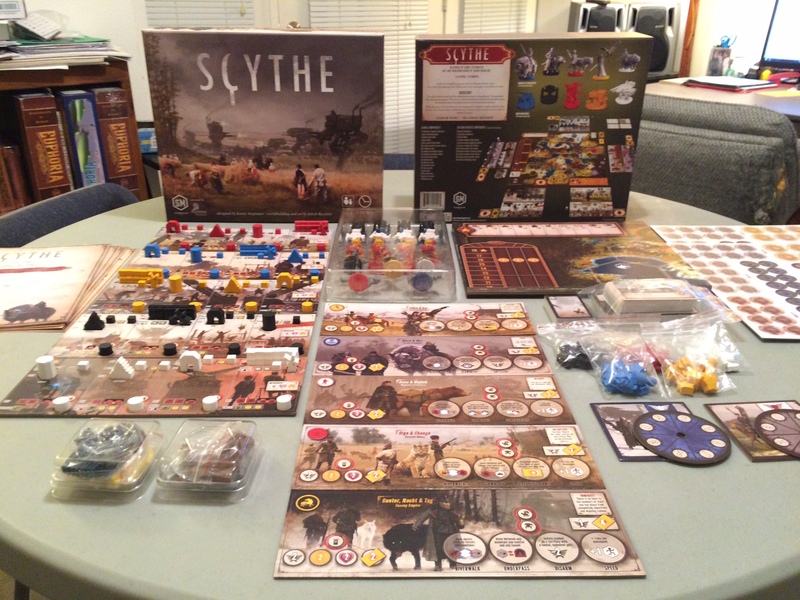 Designed by Jamey Stegmaier, whose previous titles (Euphoria: Build a Better Dystopia, Viticulture) had received widespread critical acclaim, Scythe’s breathtaking art style, promise of high replayability, and cool alternate history theme has made it into something truly special. 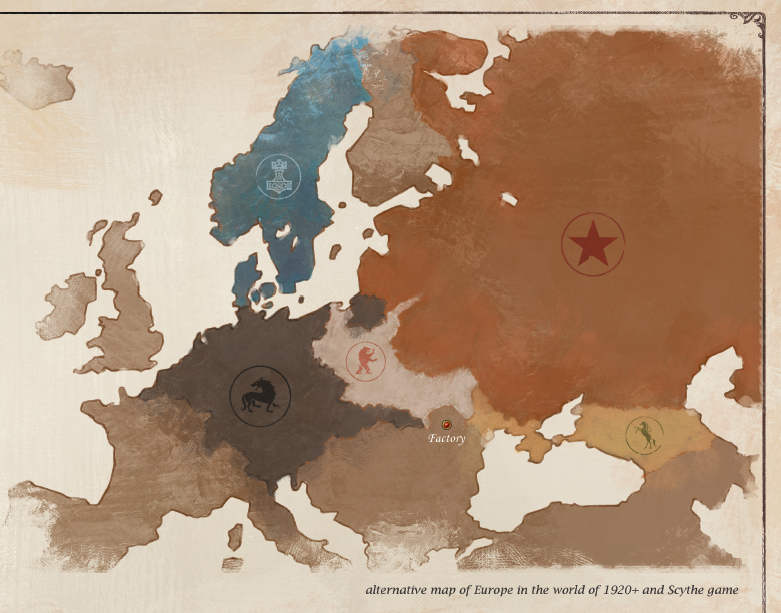 Scythe lets you take control of one of five nations battling for control of 1920s Europa: whether belligerent Saxony, subtle Crimea, or relentless Rusviets. Harvest resources, build structures and huge mechanized robots, and expand and explore your surroundings to gain control of the surrounding lands. Despite its seeming complexity, Scythe is a fairly simple game to pick up and play, and doesn’t quite have as much conflict as the art suggests. [Playing Scythe] is a little bit like sitting in a limo. It’s comfortable and elegant and it feels good. “OK,” you might say as you survey the game, “I get it—it’s a wargame.” But you’d be wrong. Scythe is more a game about the threat of war. It’s an area control game. It’s a resource management game. But over everything, Scythe is a puzzle—and it’s a very good one. The best new game I’ve played in 2016. [Scythe’s] blend of resource gathering, exploration, turn management and combat results in a conflict that’s entirely unpredictable. Because the game isn’t just about fighting, or just about farming, there are multiple approaches to confronting your opponents and winning the game, which makes for a fascinating struggle, and a game that plays out differently every time you get it out. Playing this game was like opening a watch to look at the gears in motion. Scythe’s systems spiral and coil and interlock, and none are wasted. Everything here has earned its place. Every symbol on every card and mat has been meticulously placed. A stunning amount of thought has been put into its design, and it shows so strongly in every aspect. The part of this game that is just absolutely brilliant is that upgrade mechanism. I love that! […] this game’s artwork is off the charts. […] The replayability here is very high. […] Dice Tower judgment: Excellent! Scythe is a game that stacks up amongst the competition. With its brilliant, unique theme, satisfying gameplay that holds up over repeated outings, and relatively low complexity, it’s one of the year’s best titles and absolutely worth having on your table.